Typo or comment? All-Star or also-ran? Business as usual or issues in paradise? As I’ve said before, as a former coach I love reading box scores. Because I am based in L.A., on the rare instances that I don’t catch the Spurs game on NBA League Pass, the Los Angeles Times sports page is one place I go for that educational box score. However, no one is perfect. 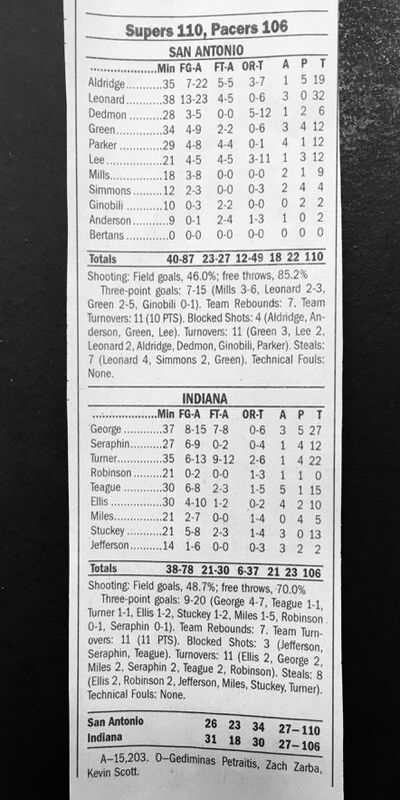 The LA Times box score from the Spurs win over the Pacers referred to the Spurs as the “Supers”. Final score: Supers 110 – Pacers 106. One or two letters can sure change a word. For instance, think about the following words, and how changing one letter affects pronunciation and meaning: Though, thought, through. Funny, yes? Though perhaps the LA Times person who checked this box score did not make a mistake, and instead thought it through! 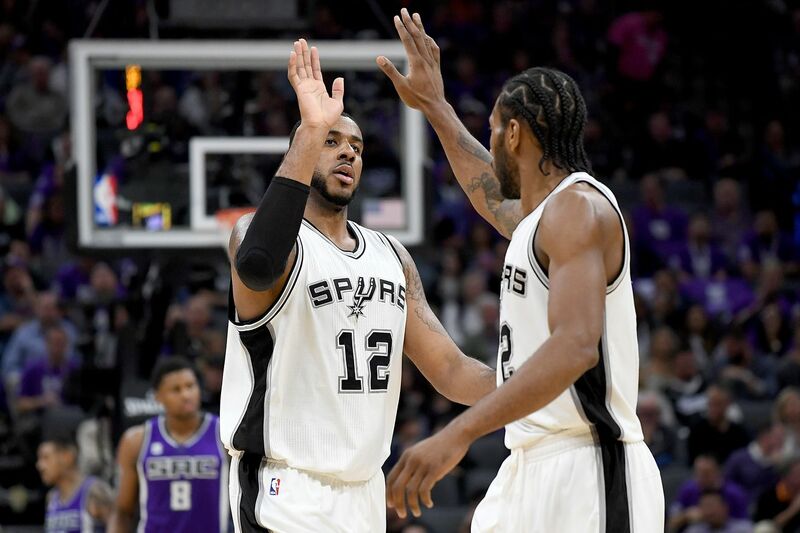 Maybe he/she decided that the Spurs are in fact Super – especially since the win over the Pacers clinched yet another above .500 season for this super team and super organization. Amazing indeed to go twenty years in a row winning more games than losing , when by definition half the teams in the league each year do the opposite. Just as Superman earned his moniker, perhaps the “Supers” does fit the San Antonio team. Interestingly, LMA was named to the All-Star game last year even though the first half of last season was clearly an adjustment period for him. He was likely selected last year as both an appreciation of his previous successes and an acknowledgement of his “sacrifice” of going to a team on which he would no longer be the primary option on offense each time down court. Of course, LMA is still getting over 14 shots per game, only 3 less than Kawhi, and 5 more than any other Spur. Some Spurs fans are feeling their own frustration with LMA. That frustration arises from his 36% shooting from the floor over the past 10 Spurs games. From a coaching standpoint, it appears to me that his footwork on his jumper has not been solid – perhaps a reflection of the sore knee that kept him out of a game recently. You can see the same thing I do: When he releases the ball, watch his footwork and balance, and try to predict whether the ball will go in or not. The past several weeks have been much more “out” than “in”. Luckily, the Spurs have the best shot doctor in the business, and Chip Engelland is likely seeing the same thing I do. Perhaps the week off for the All-Star break will be good for Aldridge’s knee. If so, that should lead to a better base, balance and footwork, and more shots will hit the net instead of the rim. And maybe that will help the Spurs’ second superstar, and the Spurs fans, start feeling a bit more super.